Marketing professionals are all about communication. Whether through words, pictures, music, or other means, the idea of promoting products and ideas to a large audience requires the use of communication. And one of the most important forms of communication, particularly when trying to pitch ideas or promote a product, is public speaking. Whether you need to speak in front of a large crowd or a small boardroom, applying the following principles for improving public speaking skills will lead to increased effectiveness as a marketer. Take these ideas for a spin in your public speaking life and you’ll likely find yourself engaging audiences, convincing clients, and turning into the best possible marketer you can be. Some experts estimate that over 90 percent of what humans communicate is not through words. When giving a pitch or talk, remember that your audience will be reading your facial expressions, hand gestures, posture, and movements as well as the tone of your voice and the words that you say. Before speaking, take a few moments to try to relax your body, stretch muscles if necessary, and think pleasant thoughts to conjure up a warm, genuine smile. While marketing professionals are not typically found standing in front of the White House, there is much that can be learned from the way that President Obama has always been able to captivate audiences with his public speaking. No matter how you feel about him personally, watching him for just a few minutes will show that Obama’s tendency to use long pauses is effective in getting his point across. Taking breaks between phrases and sentences for effect allows the listener to think and consider in between thoughts, giving room for absorption. Avoid using speech fillers such as "you know" and "like." Ultimately, the goal of public speaking is to engage your audience. However, it’s impossible to do so if you don’t actually know who they are. Prior to a speaking engagement, perform some research on those to whom you will be speaking, then gear your talk to the room full of people. Even if you have a general idea of what you need to communicate, you can still tailor your delivery to the specific group—even within the business world. For instance, what you plan to say to a group of advertising executives would be different from what you share when asked to speak about marketing to your local Bar Association. Key in on the needs of your audience and you’ll be much more likely to captivate them. In some settings, telling a short personal story about yourself may help the audience to connect with you, see you as human, and make your presentation more powerful. Without going into great detail, give your recipients a peek into your life by sharing a short anecdote. This develops trust and helps the entire room feel just a bit more comfortable while getting to the meat of your talk. One of the biggest rookie mistakes when speaking in front of a group is shallow breathing. As stage fright sets in, your body has a tendency to jump into the fight-or-flight response which causes tension and may even make you sound like you’ve been running laps prior to taking the microphone. Concentrated deep breathing exercises can keep you from hyperventilating, as well as helping your body and mind to relax so that you can give your best presentation. If you want people to listen to you, they must be able to understand your words. The diction that you use in common, everyday language is not effective for public speaking. Instead, it is critical to make sure that every word in enunciated effectively, more than you’ll probably feel comfortable with at first. Marketers know that their job is not simply about sharing information. It’s a call to action. Whether the action is making a purchase, becoming a client, or employing a new marketing strategy, the purpose of public speaking is to encourage the audience to do something. Before you speak, you need to know exactly what it is that you want the group to take away, or how you want them to respond. 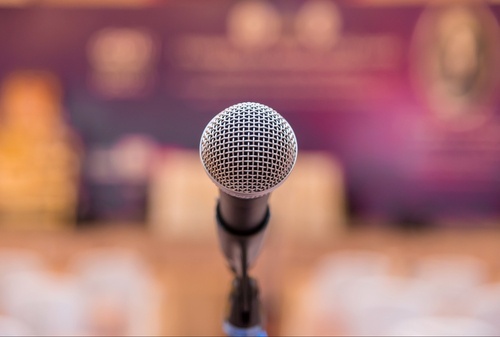 Although many marketers are often not excited about the concept of public speaking, it is a critical skill for taking marketing strategies to the next level. Developing intentionality with body language, articulation, breathing deeply, sharing personal stories, knowing your audience, using long pauses, and calling the audience to action are all principles in ensuring that your public speaking is on par.